Your wedding day is perhaps the most memorable day of your life. You can add to the memories of the day by giving a killer speech at the reception. The truth is, however, that you will be nervous and unable to give a great speech unless you write down and practice the speech beforehand. First discuss the reason why everyone is gathered in the reception hall—your wedding. Take time to reflect on what has happened so far on this day and take some time to tell everyone how you and your wife happened to get together and progress to this wedding spot. Talk about the day you got engaged. This is the time to say “my wife and I” for the first time in public. Comment on how nice it feels to say these words and how you hope to repeat them for the rest of your natural lies. Just these words can capture the hearts of your audience and can draw them into your speech. Make sure you thank the father of the bride for his kind words during his own speech to the couple. If he didn’t say any kind words, you can thank him for his humour or for his banter in his speech. This brings in the father of the bride into your family and sets the tone for years to come. Thank your guests for coming to your big day. You can collectively thank people for giving you gifts without having to mention any one gift or person unless, perhaps, your parents gave you a car or something big like that. 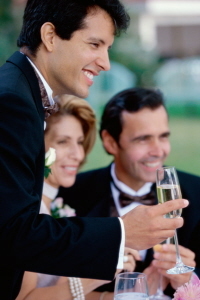 This is now the time to thank the parents of the bride for your wife’s great upbringing. Do this with the greatest of sincerity, revealing no sarcasm in our first few times together. Tell stories about you and your new bride’s life together so far. They can be funny or poignant. It isn’t time to embarrass yourself during this part of the speech. Spend some time talking about how you and your new bride met. This is the time for you to bring out funny stories or interesting anecdotes about your wife. It’s time to celebrate the time you’ve had together and to share interesting stories with people who may not know you very well. You should be more comfortable by now and can open up to the crowd about how you feel about your new wife. Keep using “wife” as it solidifies this new relationship you have together. Take the time to thank your best man for being the “best man” and for giving a nice speech. People expect this part of the speech to be light hearted so if you’re going to crack jokes, do it in this section of the speech. Recap how this day has gone so far once again and tell people how you feel about your special day. This would be a good time to toast your wife. Category DIY Speeches | Tag Grooms Wedding Speech | Bookmark the permalink.